Kolonia, Pohnpei—During Saipan’s Governor Ralph Torres’ visit to Pohnpei to attend the meeting of the Pacific Islands Development Bank, he invited Kolonia Town Mayor Jose San Nicolas to go to Saipan for a visit. The Mayor jumped at the opportunity and made the trip at his own expense just two days after the gala opening of the now heavily used China Kolonia friendship gym. During the visit, Governor Torres asked San Nicolas how Saipan could help Kolonia Town. San Nicolas said that he first offered help on the problem of recycling of scrap metal that has become a big problem since China banned the importation of metals. That ban meant that the Chinese owned scrap metal yard in Nett closed down. But Mayor San Nicolas said that Kolonia had already made arrangements with a company from Taiwan, the details of which are in their final stages. Instead, San Nicolas asked the Governor if Saipan could potentially provide expert trainers for the Kolonia Town Police Department since Kolonia has no police academy. The governor agreed to that and more and has organized a group of instructors that is set to arrive in Pohnpei on May 17. San Nicolas has written to each of the police departments in Pohnpei’s municipalities and to the State Police to invite those departments to attend the training exercises. In addition to offering the training, which will also include paramedic training, Governor Torres also offered two used police vehicles, a used ambulance, and firearms for the police force along with the shipping costs for those items. San Nicolas said that he notified the FSM Secretary for the Department of Justice, Joses Gallen of the handgun donation and agreed that the handguns should be shipped to the National Police for safekeeping until legal matters can be resolved. San Nicolas said that he doesn’t think that there is currently law on the books that would allow officers of municipalities to carry firearms but that he also wasn’t certain whether the law prohibits. He is seeking clarification on that matter from AG Gallen. Additionally, none of Kolonia’s officers are currently handgun certified, though the matter of certification will change after the professional police trainers arrive if they are allowed to train with the weapons. That remains to be seen. 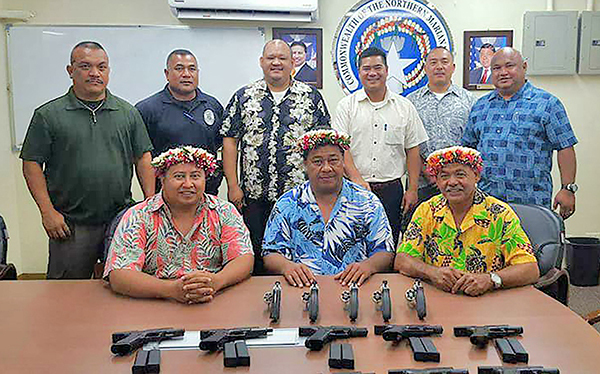 He said that CNMI has previously donated handguns to FSM states but those donations were to the states and not to municipal governments in those states. Some have vociferously questioned the need for an armed Kolonia Police force since handguns are banned in the FSM. In a social media conversation on the issue, Kolonia Town Council Speaker Jack Harris reminded readers that approximately two years ago a lone gunman approached the Kolonia Town hall and started firing live rounds. Four unarmed Kolonia Town police officers had to hide until the gunman stopped to reload at which time they were able to disarm him. San Nicolas has also mobilized the donation of a used fire engine for Kolonia’s fire department. When asked why it would be necessary for Kolonia Town to have a fire department he said that within the first seven months after assuming the position as Mayor, three houses burned down in Kolonia. He said that nothing could be done at the time other than to have the police cordon off the area and to try to keep the fire from spreading further. Pohnpei State now has a fire truck that works but it didn’t at that time. The Town Council quickly voted to establish its own Fire Department and has trained fire fighters but no equipment. He said that the donation of the fire truck came from a personal business contact in Guam, Ross Morrison of Morrico Guam where VCS Construction buys much of its heavy equipment. He said that Morrison has agreed to donate the 3000 gallon fire truck to Kolonia Town but only if the equipment can also be used elsewhere in the State which will require an MOU. As we left his office he pointed to the large sakau stone in the yard of the Kolonia Town Hall. “You see that stone? We had two fund raisers for Pohnpei athletes for the Micro Games around that stone. They raised $10,000 each,” he exclaimed.